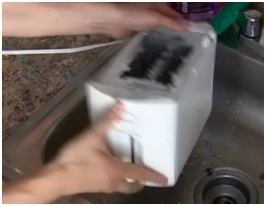 How to clean a toaster inside and out is very easy to do. Toasters are used daily when you have a family. 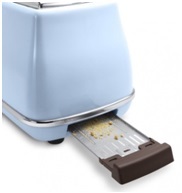 Being single, I use my two-slotted toaster about three times a week and it still gets grimy. 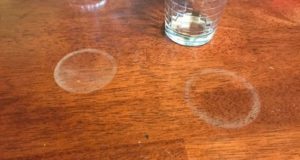 When sitting out on the countertop bread toasters get grungy on the outside from splashes, grease from cooking, and fingerprints. Mine is brushed chrome and others are made of hard durable plastic, but they all clean up the same way. 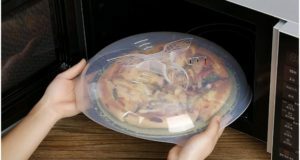 The build-up of crumbs in the bottom removable tray can cause a fire. I will tell you what happened to me. I will never put iced raisin bread into my toaster again. It’s a blessing I was at the kitchen sink when the plug to the outlet started a fire close to the window curtains. The icing melted and it ran into all the parts inside preventing the springs to release to pop the toast up. The heating elements stayed on so it overheated starting the fire. Because the fire that scared me to death was at the plug, I could not pull the plug with cord out. With my circuit breaker box being only a few feet away in my laundry room, I turned off the breaker to the power in the kitchen. I then had to use pliers to remove the plug from the wall. Fortunately, they were in a junk drawer near the toaster. The flames shot up a good foot high; however, the curtains were not caught on fire. Never ever use an extension cord that is not the same AWG (American Wire Gauge) as the cord on the toaster. You will have a fire because of the amount of power (Wattage) the toaster puts out. 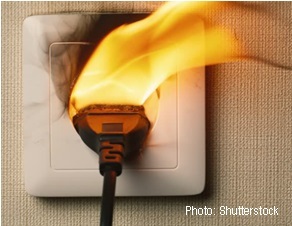 Be sure the cords are UL® (Underwriters Laboratories) listed and that they never feel hot when in use. Your entire house electrical system should be grounded as well. Do not use a power strip with many appliances plugged into it, and never use the adapters shown on the right. These will start a fire! The toaster plug can go into a 2-receptacle plug-in with something not drawing heat where they can be plugged into at the same time such as a food processor. The first thing you do like your morning coffee, is to unplug the toaster cord from the wall receptacle. Be sure the toaster is cool. Never put a toaster into water! You will ruin the electronics forever. Next, move the toaster over the sink and pull out the crumb tray on the bottom with its small pull-out tab or grab handle. Most trays can be soaked in the sink with hot water and dishwashing detergent. I like to brush the crumbs off first with an old toothbrush. It’s usually aluminum, so caustic cleaning chemicals can tarnish it. Don’t use steel-wool pads because they are abrasive and crumbs will stick into the scratch marks. Shake the toaster over the sink to remove the crumbs and chunks of toasted bread stuck to the sides, top, and wires that heat inside. The next part for removing more crumbs can be tricky and dangerous to the heating wires. You can take it outside and use canned air that we all use on our keyboards, leaf blower, or even a hair dryer over the bathtub. I use canned air to clean my pleated lampshades and it works like a charm to remove dust and tiny spider webs. What I do is take a very small dry toothbrush and brush the sides inside being careful with the wires in the middle that are the heating elements that brown your bread. You can kill a toaster quickly touching the wires too hard as if they were your itching mosquito bite. Never get water inside. After it’s cleaned like a shiny wine glass, rinse it and towel dry with a cotton cloth. Allow it to air dry further while you clean the outside so that’s it’s not wet or damp when you put the crumb tray back into the toaster. It’s best to not use the toaster for 24-hours after you clean it. If your toaster is polished or brushed stainless-steel, use vinegar or window cleaner sprayed onto a clean white cotton cloth. Paper towels will break off on corners and edges requiring tweezers to remove. Do not spray directly on the surface because the wet will get inside. You can do the same for plastic toasters on the outside too. Don’t forget the handles or knobs when cleaning a toaster. 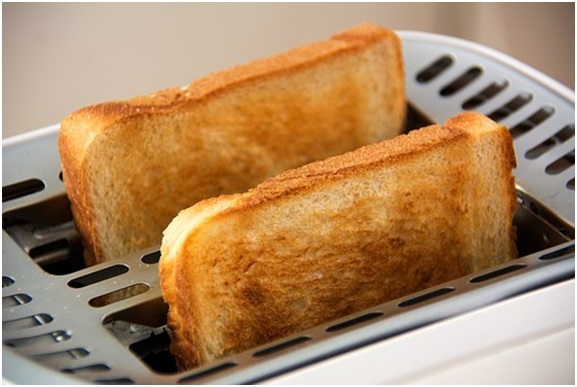 Covering your toaster will prevent dust and splatters from accumulating keeping it clean. These are available on Amazon.com® dirt cheap in many colors to harmonize with your kitchen décor. The fabrics are vinyl, cotton, polyester, and quilted texture. The covers are made to cover 2-, and 4-slice models and those with long slots. The fabric toaster covers are machine washable and the vinyl clean up in the sink by hand washing quickly. It’s recommended not to put iced breads or bagels, some strudels, or other gummy food items into a toaster. It’s best to use a toaster oven or microwave. Pop-tarts® don’t seem to have a problem, but the ones with sprinkles on top do fall off into the crumb tray and stick to crumbs. Frozen pancakes and waffles are okay to put into your toaster. 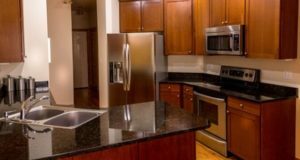 Leave your comments, questions, or ideas about cleaning toasters below and let me know what you like best to clean your copper cookware. I will reply to each of you. How to Clean a Toaster video.